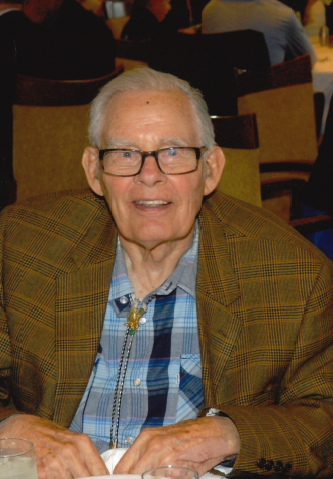 Merle Kenneth House, 88, died March 31, 2019, in San Jose, from complications of Parkinson’s. Merle was born October 8, 1930, to Agnes (Mapes) and Irl Thomas House in Hays, Kansas, and grew up with 1 sister (Mildred) and 6 brothers (Dewey, Hugh, Wilbur, Melvin, Irl, Franklin). His family struggled during the Depression; his father frequently was away building oil derricks, his mom and sister worked as laundresses, and the boys did odd jobs. Merle shined shoes, and worked as a pin-setter at the local bowling alley. His mother and siblings subsisted on oatmeal, fried mush, eggs, biscuits, yams, and fried potatoes. Merle remembered eating meat and a “better diet” only at annual family reunions. At age 14, Merle hopped a bus to Abilene with brother Melvin to volunteer for yard work at then General Dwight D. Eisenhower’s house. At Hutchinson High School, Merle was an impressive gymnast and the family enjoys many pictures performing stunts with his brothers and fellow corpsman and memories of him doing handstands and back flips into his 40s. Family, God, and country were Merle’s passions. Joining the US Navy in 1950, he trained and served as a hospital Corpsman in Japan during the Korean War, submarine duty on the USS Remora, and two tours in Vietnam during his 20 years of service. Merle received many commendations and awards during his military career and was an expert pistol shooter on the Navy Marksman team. He was attached to the Marine Corps in El Toro Marine Corps Base, as the USMC does not have its own medical staff, they call up only the finest Navy hospital corpsman to serve alongside. We believe Merle chose to be buried in his Marine Corps uniform as it was a high honor and highlight of his military career to be a USMC “Doc”. After military retirement in Monterey, California, Merle moved to Gardena and Harbor City in Southern California in 1973. He worked as a roofer, Oldsmobile salesman, and as medical examiner for the insurance industry until his civilian retirement in 1995. For many years in retirement, Merle wore the red coat of a wheelchair transport volunteer with the VA Medical Center in Long Beach. He made many friends there and was proud to serve those who served. Merle dearly loved his grandchildren and always found time to visit, read aloud, and talk with them about his life. A born-again Christian, Merle joined his mother’s church in Southern California, and faithfully attended bible study, Sunday meetings, and annual church conventions in Buttonwillow, California, until he was no longer physically able. Until his civilian retirement, Merle often wore a 3-piece suit. After retirement, casual dress meant nothing less than slacks and a dress shirt or western shirt and bolo tie. To our knowledge, he never owned a pair of jeans or shorts as an adult. Merle had an obsession with automobiles and airplanes. He could identify the year, make, and model of any car by sight. He loved to draw airplanes, earned his pilot’s license in his 50s, and joined a club that restored an airplane. Known for frugality borne from being a child of the Depression, he preferred hitchhiking to renting a car, and hopping military flights rather than flying commercial. Relocating to San Jose in October 2012, Merle was soon after diagnosed with Parkinsonism. As a Vietnam “brown-water” vet, the condition was considered related to Agent Orange exposure. The VA took wonderful care of him. In August 2015, as he needed more care, they found Merle an excellent veteran’s home, owned and managed by devoted caregiver Philomena Agbontaen. Philomena and her staff provided Merle with expert, loving care, and always treated him with dignity and respect. It was a constant comfort to Merle’s family to know he was in such good hands. Merle is preceded by first wife, Brita (Axell), to which eldest son, Ronald, was born; second wife, Barbara (Bilsland), to which son, Kenneth, and daughters Cynthia (pre-deceased), and Michelle were born; and 3rd wife, Dolores “Dodie” (Duncan). He is survived by brother Wilbur (Melitta) House; half-sister, Marilyn (Bob) Drake, sons Ron (Cheryln) Kelly, Ken (Petra) House, daughter Michelle (Brad) Foote, stepdaughters, Bonnie Pigg and Cheri Leighton, and 6 grandchildren: Falon Miller, Dierdre Axell-House, Matthew Axell-House, and Kimberly, Evan and Lauren Foote. Services will be held at 11 am on Saturday, April 27 and Saturday, May 4th at Darling and Fischer Campbell Memorial Chapel, 231 E Campbell Ave, Campbell, CA. Interment, with full military honors, will be held at Fort Rosecrans National Cemetery in San Diego, CA on Monday, May 6th at 1:30 pm. There's still time to send flowers to the Funeral Service at the Darling & Fischer Campbell Memorial Chapel at 11:00 AM on April 27, 2019.